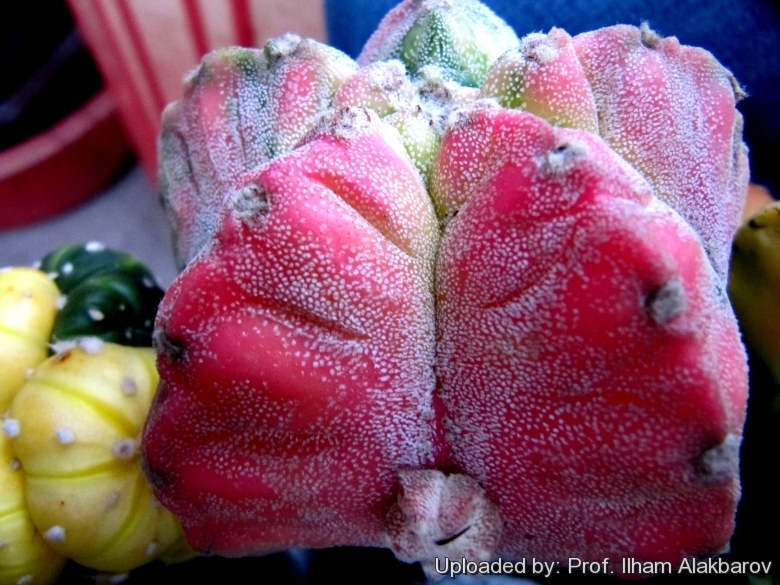 Pictured form: The pictured form (Astrophytum myriostigma f. picta) has stem variegated with yellow, orange, red and violet. These pictured plants are very attractive and highly prized. They are often seen grafted on stronger columnar species, and cannot cannot be easily grown on their own roots. However some clones have enough chlorophyll in their tissues and can be grown on they own roots too, but very slow growing. Stem: Globular to cylindric up to 30 cm tall (but occasionally up to 50 or more cm tall) and 10-20 cm in diameter, bright green variegated with yellow, orange, red and violet, covered with many minute white hairy scales that give it a characteristic silvery-grey appearance, but sometime naked. The scales are composed of very fine interwoven hairs, which, under a microscope, are very pretty object. Propagation: Usually by seed. Plants are often grafted onto column-shaped cacti.